I had dinner with a couple friends last weekend at KO Prime. It was very tasty and definitely satisfied my steak craving (I had the Kobe Flat Iron). 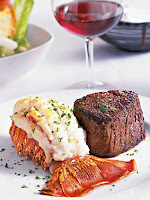 In another few weeks though, I'm planning on checking out one of these two deals: Flemings or Ruth's Chris. Start your summer off right by joining us for the Summer Celebration at Ruth’s Chris. You and a guest can enjoy 2 three- course meals for $89. Begin with a soup or salad, followed by an entrée and a side dish. Choose from five entrée courses, including our signature filet, our fresh fish selection or our delicious chicken. End your evening sharing one of our homemade desserts. There’s cause for celebration this summer at Ruth’s Chris. Available for a limited time. Click (here) to go to the Ruth's Chris RSVP site. I think I'd probably go for the Ruth's Chris deal. It gives you a little bit more freedom in your choices and it'll be right down the street from me after I move. Also, if I want a lobster tail, I'd go local (here) not Australian. 0 Response to "Beef ... It's What's For Dinner - Special Deals"